So, I found these on Kim's blog a while back and bookmarked them waiting for when I had a good reason to make them. Well that time has come my friends. Im having a trunk show for the Splendor Shop this weekend and I want the table set up to be along the lines of whimsical and vintage. 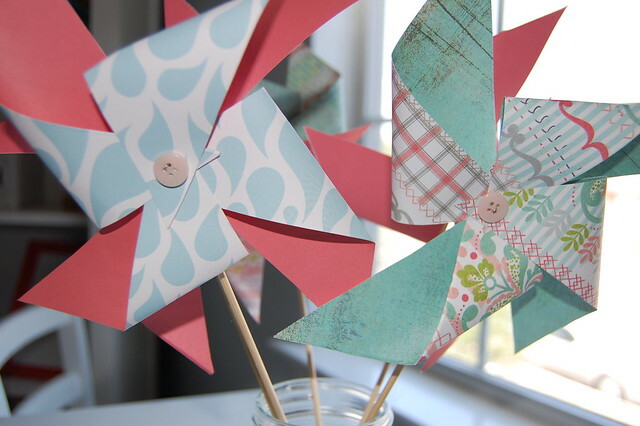 Cue the pinwheels. Oh my word are these not just so adorable. They seriously just brighten up any room. They are my new tissue poms...maybe even my new bunting. Stop it right now. I know. I made a bunch of these the other night as I watched B do his p90X workout. Because thats what we do at 11 at night. He works out and I make things. Crazy kids. 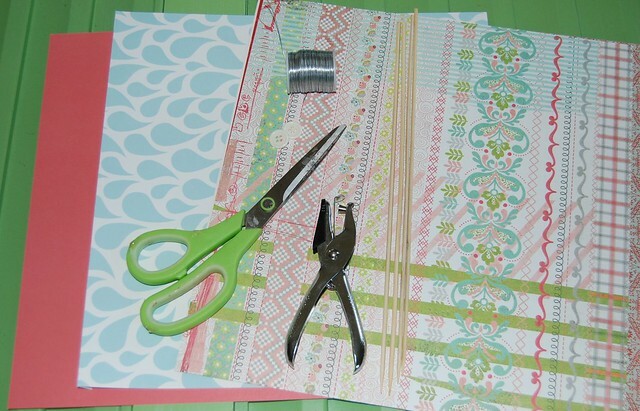 Scrapbook paper. I got mine at Michaels. 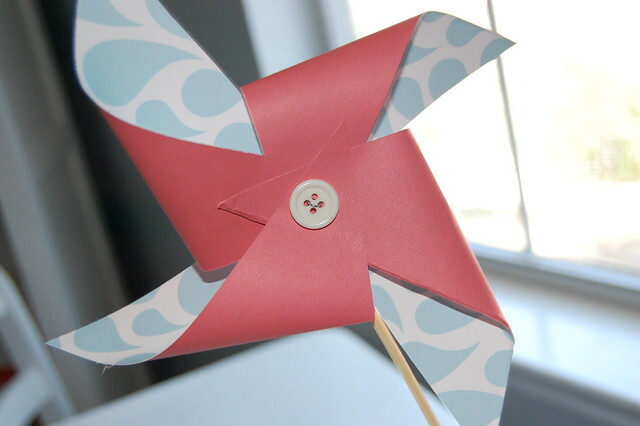 It is 2 sided which makes the pinwheels even more fun. 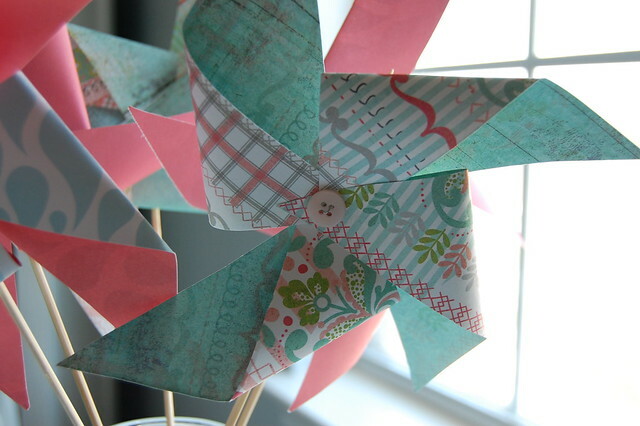 One sheet will make 4 pinwheels so you don't need much. 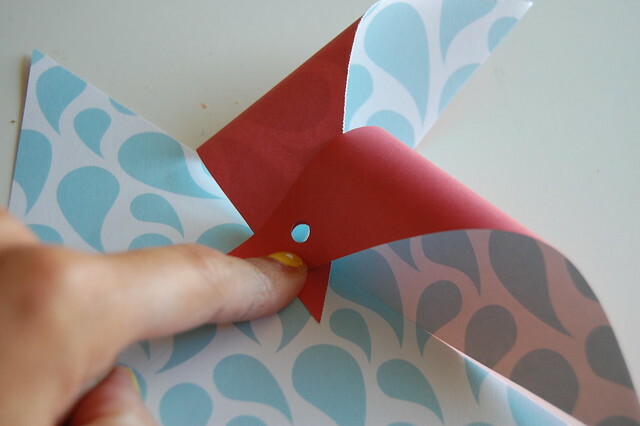 First fold your sheet of paper in half and then again. 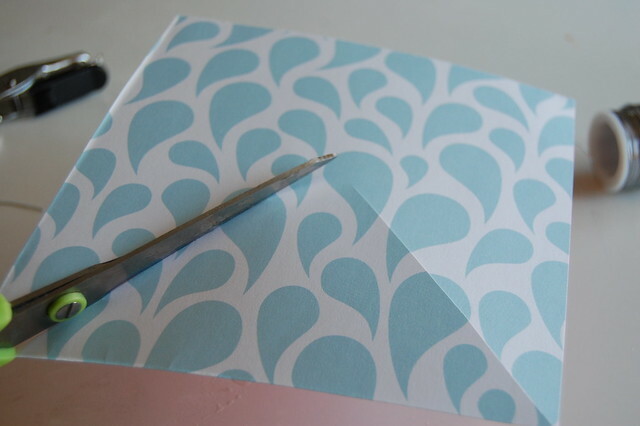 Then open it back up and cut along the fold lines to get 4 seperate squares. Then take one of your squares and cut it from one corner of the square, to the middle. Careful not to cut it all the way, you don't want to disconnect it and make triangles, so leave room. 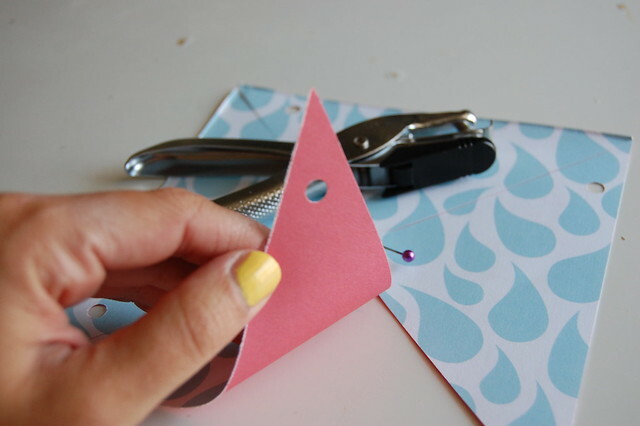 Do this at each corner, then grab your hole puncher and punch one hole into each corner. Poke a hole in the middle with either a push pin or a needle. 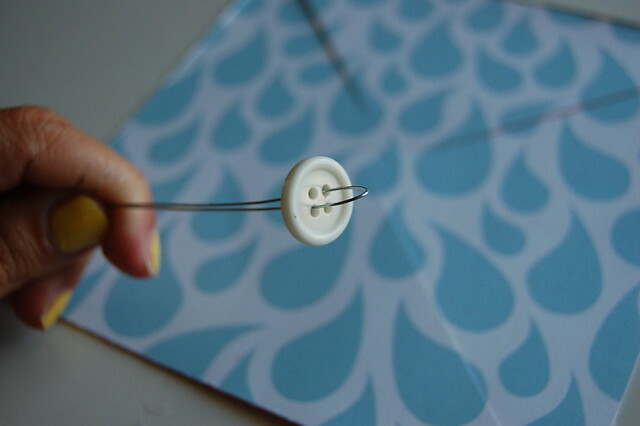 Then fold your floral wire in half and thread it through your button. Do this before the next step. Trust me. I'm a professional. 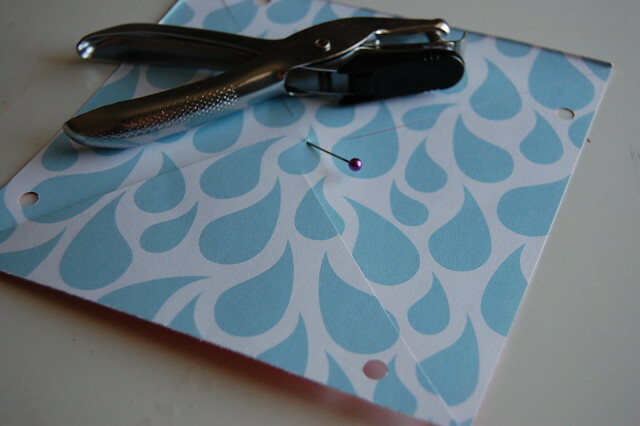 Take one corner and place the hole you just punched, over the hole you made with your needle in the middle. Do this with each corner hole. 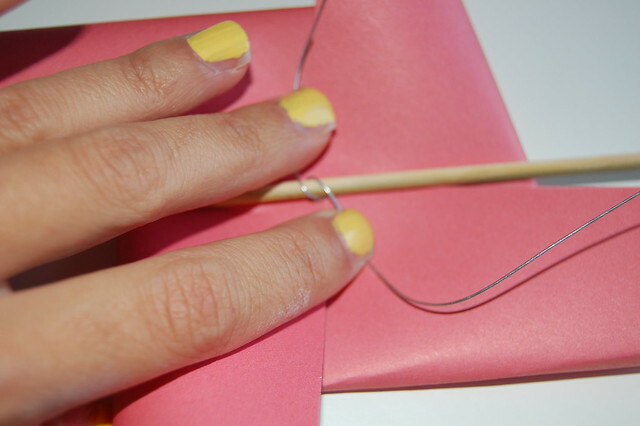 Grab your floral wire and while holding all of the folds in the center, push your wire through the middle and pull it snug. Twist the wire in the back a couple times, then get your skewer and attach it to the back by twisting the wire around your skewer. And thats it. You are done. But you won't be able to stop at one, so go ahead and just keep going until you realize you went over board. Put them in a cute glass jar for your kitchen, a window sill, a bedroom, a babies nursery....Anywhere. 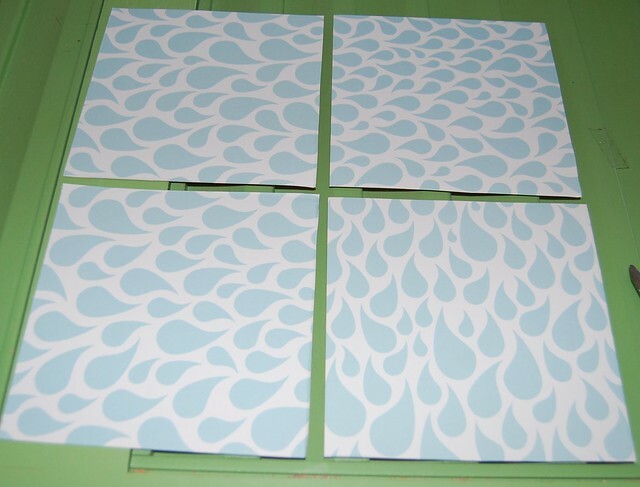 Or use them as decor at a birthday party or baby shower. Heck stick to one to your car antenna. They are just so fun. It would be cute to make them into a garland too. Instead of attaching them to skewers, use your wire to twist it over some twine and then string it up. Oh stop it right now, that would be adorable. P.S Keep out of reach of 3 year olds. They will not understand why they don't spin. They will not listen when you tell them they are just for show. This will be confusing for them. They will continue to try to blow them to make them spin, then get frustrated and possibly throw it to the ground. 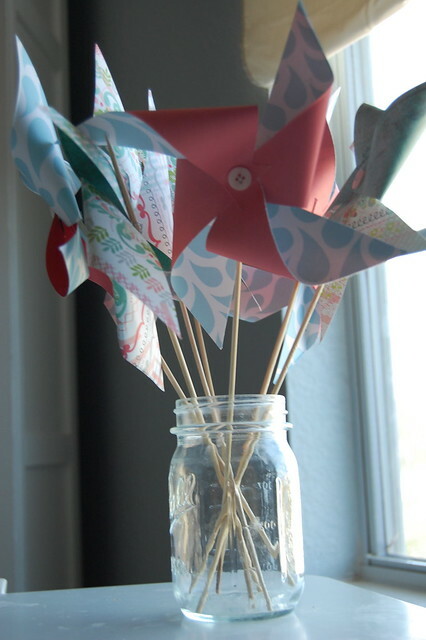 This will result in a ruined pinwheel. This would be a shame. Those are so cute!! Definitely going to use this for my next party! Thanks for the tutorial!! Thanks Laura, I'm definatley going to make these along with some tissue poms. :) I have to do some decorating for a family Mother Daughter retreat in a few weeks. Thanks to your creativity it's going to be simple and at the same time very nice. You're awesome!! Olivia said she would like her auntie to make her some for her nursery :-) super cute! hope your trunk show is a massive success! Hope the show is a success! You have great points there, so I always visit your blog, it looks like you are an expert in this field. keep up the good work, My friend recommends your blog. How cute would these be all over a Christmas tree as ornaments?!?! You could string them as garland or place them individually all over... I am getting inspired for the holidays as I freeze in my house trying to shield myself and baby from the HEAT! What the heck is the use of a pinwheel that doesn't spin? I agree with the three year old. As was the point of making them and posting this tutorial. Sorry you seemed to miss that.